June 1980: Voters approve 25 year local gas franchise to "Gas Service Company" (at ? ?% of gross gas sales to City). Note: I could not find any wording in the 1980 news relating to the percentage for the franchise tax. 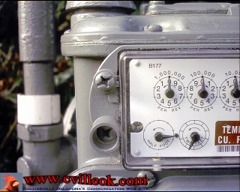 May 16, 2005 GAEngineering appraisal (of ONG gas system) authorized by City Commission. Report about Granite and Mannford city owned gas utilities heard. May 23&25, 2005 Kevin Glover of GAEngineering here for gas system appraisal and report to city officials. May 31, 2005 ONG officials address City Commission after another executive session. ONG states they have never sold a franchise to a municipality, and don't wish to start. June 6, 2005 City Commission approves purchase option subject to citizen vote. June 22, 2005 "Collinsville News" reports ONG & Collinsville Vice Mayor Gail Rogers "spoke out against the city's purchase of the gas system". July 1, 2005 KTUL News Channel 8 reports ONG rate hike request of more than 99 million dollars (to the Okla. Corporation Commission). Citizens called for phone survey ... apparently sponsored by ONG? Citizens "For" the gas franchise buyout formed: "Citizens For Collinsville"
Citizens "Against" the gas franchise buyout formed: "Citizens for Reliable Gas Service"
July 21, 2005 "Town Hall" meetings called for at Library. Two more scheduled July 28 and August 4th. I don't know how far back the 25 year cycle of gas franchise renewals goes in Collinsville. I couldn't locate any gas related story in the summer of 1930 archives of "The Collinsville News". I did find one May 1930 advertisement indicating the local gas company was: "Natural Gas Utilities Company". In June of 1955 Collinsville voters approved (193 for - 15 against) a new 25 year gas franchise to "Ruth Fuel Company". Ruth Fuel started in Collinsvile in 1934. 1955 stories stated that Ruth Fuel had 893 customers and paid the City of Collinsville $2,230 as their 4% franchise tax (on gross gas sales) in 1954. Without further research, I don't know how long Ruth Fuel remained in Collinsville, but I'm fairly sure they still had their local office here, managed by E.F. Patton, into the 1970s. Even fewer voters turned out in 1980 when "Gas Service Company" (& it's heirs) was granted a 25 year gas franchise. That June 1980 vote was 58 for and 7 against (out of 1,343 registered Collinsville voters). A pre-election story in 1980 indicated that the city was not completely satisfied with Gas Servcie Company and had even tried to interest Oklahoma Natural Gas in purchasing the franchise. Again, I don't know how many or who all the franchise holders were in the last 25 years (other than Kansas Gas Service in 1999 and ONG most recently). Based on public conversations at the Feb 21, 2005, City Commission meeting, it appeared that ONG would be in line for a "normal" 25 year renewal of the gas franchise with the exception of one item. That exception being that ONG was remitting a 2% franchise "tax" to the City of Collinsville instead of the 4% called for in the city charter. I didn't hear any followup discussion to that topic as discussions were held in executive session for several weeks on first "ONG Rate Case", then "ONG Franchise" by May 2nd. Apparently in investigating the franchise wording and possible options to proceed, Collinsville officials decided to explore the franchise option for the city to purchase and operate the gas distribution system themselves. 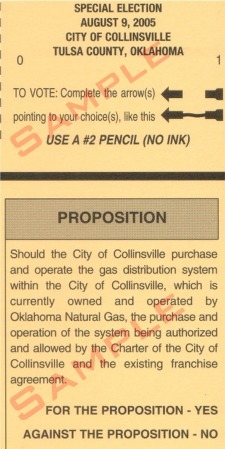 The May 16th city commission agenda was the first to contain the wording to consider: "... exercise the option contained in the current franchise, to purchase the gas utility from Oklahoma Natural Gas and directing staff to begin the purchase process as outlined in the current franchise agreement". In subsequent meetings, City officials heard from ONG officials, municipally owned gas utility officials, and their appraisal firm (Kevin Glover of GAEngineering Dumas, Texas). Finally on June 6th, the City Commission approved the franchise purchase option and called for a special election for Collinsville voters. That vote is scheduled for Tuesday August 9th, 2005. I suspect the number of 2005 voters will easily top the 1955 and 1980 gas franchise elections. Citizens groups have formed both "For" and "Against" the City's purchase of the gas lines and meters inside the city limits of Collinsville. The ballot for City voters on Aug. 9th will look similar to this ballot when they decide if Collinsville should purchase the local gas franchise.